The best of the Outer Hebrides in one fantastic holiday! From Lewis to Barra, this wonderful week long package gives you a taste of all the main islands that make up the Western Isles - truly a holiday to remember! Amazing sea cliffs along the Lewis coastline. Lewis archaeology - the island contains some of the UK's finest ancient monuments. The staggering beaches of West Harris - without doubt some of the most beautiful in the world! The flower rich machair grasslands of the Uists & Berneray. Incredible numbers of ground nesting birds on the west coast of the Uists. The beautifully sited Kisimul Castle, in Castlebay, Barra. The Outer Hebrides is a land apart - an island archipelago stretching for over 120 miles down the north west coast of Scotland. Here on the fringes of Europe lies the heartland of Gaelic language and culture, once the native tongue of all Highland Scotland. This is a land of dramatic mountains, huge deserted beaches, turquoise seas, countless freshwater lochs and abundant wildlife. The wild island interiors are virtually uninhabited, whilst small crofting communities farm the fertile machair grasslands that can be found along many coastlines. ​This memorable self guided holiday takes you on a relaxed meander up or down the island chain, from Lewis in the north to Barra in the south, sampling the best walks on each island along the way. You can travel in either direction - the choice is yours. Staying in comfortable guest houses, over the course of this trip you will visit at least 10 separate islands, walk on some of Britain's most beautiful beaches and experience the incredible variety of landscapes that the Outer Hebrides has to offer. From the dramatic seacliffs of Lewis to the world famous beaches of South Harris, the unique flower rich meadows of the Uists and the wonderfully relaxed atmosphere of Barra, this is surely one of the finest touring holidays in Britain. We provide everything you need for a wonderful holiday. We arrange all accommodation and ferry crossings and provide you with a comprehensive information pack to help you get the most out of your visit to the islands. We include a recommended walking route for each day, along with lots of suggestions for alternative routes we think you might enjoy. Three walking guide books and a complete set of Ordnance Survey 1:50,000 Landranger maps for the Outer Hebrides will make sure you don't get lost! We also provide details of a wide range of other outdoor activities available on the islands, as well as ideas for things to do if the weather is not great. I just wanted to let you know that we had a great time on our Outer Hebrides trip. The arrangements you made for us were excellent. Favourite hotel was Langass Lodge, closely followed by the Harris Hotel, especially when we moved to our 2nd room (room 2), which had its own small lounge! And the itineraries you suggested were also excellent, despite the weather at times. Only disappointments were not seeing either eagles or otters; but bonxies for the first time, a short eared owl hunting for food, and many flowers, including orchids. This was the first time we had used an agency like Hidden Hebrides to arrange our holidays and we were a little apprehensive. We should not have worried because everything went very smoothly. All our ferry crossings and B&B accommodation arranged for us, not to mention all the walks and visits. All walks were carefully explained with the help of a guide book and ordnance survey maps provided. These were carefully marked with the walks, places of interest, restaurants and all our accommodation. Suggested restaurants were also to a high standard. Two of them we liked so much we visited twice. Our walking was set for our ability as experienced hill walkers and we would strongly recommend good boots. We were vey lucky with the weather and did not use waterproofs until the last afternoon. Nevertheless make sure your waterproofs are of good quality, if only to protect you from strong winds ,which we did experience. The Outer Hebrides have to be seen to be believed and when you are shown the very best as we were, you need a good camera for all those memories. How long: 9 days / 8 nights (longer or shorter trips are also available). Base: 2 nights on Lewis, 2 nights on Harris, 2 nights on North or South Uist or Benbecula, 2 nights on Barra, staying at comfortable guest houses / B&Bs. Price: From £793 per person, based on two people sharing a twin / double room. Includes all ferry fares (based on car + 2 passengers). Below we have added a suggested itinerary for this holiday which would make for a fantastic 9 day tour of the Outer Hebrides. We have described a tour starting in Lewis and heading south to Harris, the Uists & Barra. However, this holiday can also be done in the opposite direction. As part of your self guided package you will receive comprehensive information on other walks on each of the islands, plus ideas for alternative outdoors activities and things to do if you fancy a day off from walking, or if the weather isn't great. Treat the itinerary as a starting point, and amend it as you wish! Day 4. Huisinis & Cravadale. This memorable and varied low level hike must surely be one of the best in Scotland. Starting at the beautiful machair meadows of Huisinish, you will visit the huge golden sands of Traigh Mheillin beach which provide unparalleled views to the nearby uninhabited island of Scarp. From here the route takes in the remote and beautiful Glen Cravadale, with a good chance of spotting golden or sea eagles along the way. Day 5. South Harris & Berneray. Start your day with a visit to the exquisite medieval St. Clement's Church at Rodel. Standing on a small knoll looking out over the Little Minch to Skye, this striking, square-turreted chapel contains some of the best preserved mediaeval carvings in Scotland. Afterwards, if you have time to spare, take a short walk on the small path linking Rodel and Srond, admiring the stupendous seaviews that unfold as you gain height, then make your way to the ferry terminal at Leverburgh to catch the late morning ferry across the Sound of Harris to Berneray. 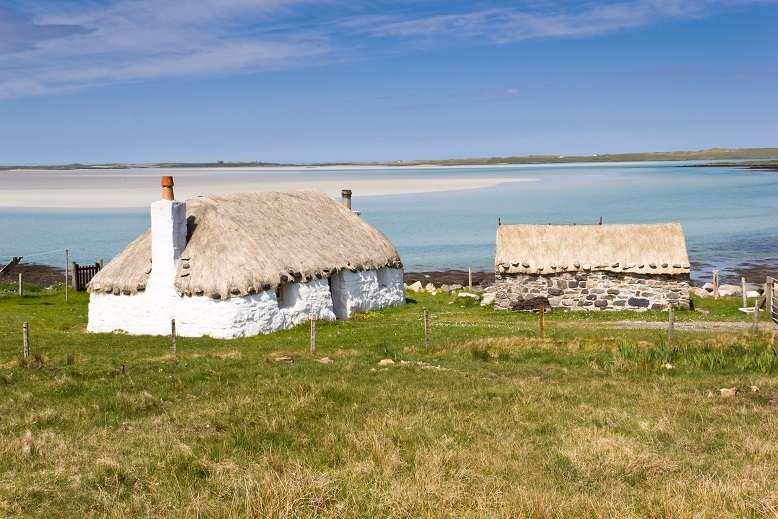 Spend the afternoon walking around Prince Charles's favourite island, admiring the traditional thatched croft houses, its machair meadows (which in spring and summer are rich in flowers and breeding birds) and some of the finest beaches in the Hebrides on the island's west coast. At the end of the day drive to your next B&B on the Uists. Day 6. The Udal Peninsula. This is one of our favourite walks in the whole of the Hebrides - a beautiful excursion around a North Uist peninsula visiting beach after deserted beach, with ever changing views over turquoise seas to nearby islands. In summer the machair grassland here is a carpet of wildflowers and home to countless wading birds. There is some fascinating archaeology along the way too. Day 7. Howmore & Loch Druidibeag. Howmore, on the west coast of South Uist, is one of the island's most peaceful and attractive settlements. Start the day by exploring its beautiful ruined chapels before heading off on this magnificent circular walk around Loch Druidibeag and the surrounding machair. The loch is one of the finest in the Uists, with a ruined island castle and the dramatic hills of Beinn Mhor and Hecla rising from its southern shore. Further on along you will meet some friendly Eriskay ponies - similar to Shetland ponies, these lovely animals are ridiculously photogenic. The route then heads across the meadows and hayfields of the South Uist machair, which in late spring and summer are a riot of wildflowers and calling birds. At the end of your walk, take a leisurely drive down to Eriskay at the southern tip of the Uists and catch the evening ferry to Barra and your next B&B. Day 8. Vatersay & Eoligarry. Barra is tiny but great! It's intimate scale and relaxed way of life makes it many visitors' favourite Hebridean island. Today we suggest a trip up to Eoligarry at the north end of the island to walk the beautiful beaches and machair meadows...and watch the only scheduled air service in the world where the plane lands on a beach! This is (obviously) dependent on the tide, so flight times change each day. It is, however, an amazing sight and one we highly recommend. If you have time, a walk around the stunning island of Vatersay - connected to Barra by road causeway - is also highly recommended. Day 9 . Depart on the ferry from Barra to Oban. If preferred, we can arrange accommodation at island hotels. The Caberfeidh Hotel in Stornoway is a good (if pricey) option, whilst the Harris Hotel in Tarbert offers good, refurbished rooms and good food at reasonable rates. Langass Lodge and Hamersay House in North Uist are excellent, with comfortable rooms and wonderful food. Lochboisdale Hotel and the Pollachar Inn provide good accommodation at the south end of South Uist, whilst the Castlebay Hotel is an attractive base for exploring Barra. The grade of this holiday is Easy / Moderate. Most walks are relatively short (5 - 7 miles) and none should take more than half day. Most walking is close to the shore, either on beaches or the grassy machair fields. Some of the walks can be a bit wet and boggy in places and the hike to Huisinis and Cravadale includes a short but steep and rocky path that traverses a steep hillside. There are a couple of very small hills (Ruabhal in Benbecula, for example, is less than 400ft (125m) above sea level!) but these are well worth the effort for the wonderful views they provide. The walks at Tolsta Head and on Vatersay crosses some rough moorland in places. Can I make the holiday longer / shorter? Yes! Just tell us how long you would like to spend exploring the islands and we will put together a customised itinerary for you. What equipment do I need? Your equipment needs to be capable of coping with the very variable weather we get in the Outer Hebrides. It is quite possible to get driving rain, fog, then glorious sunshine all on the same day. It is also possible to get sunburnt in March and to have snow showers in May, so be prepared! We strongly recommend walking boots rather than shoes as the terrain on the islands tends to be rough, wet and uneven. Walking poles are optional but can be useful. A list of suggested equipment can be found by clicking here.